As the name suggests, the Shetland Sheepdog was originally bred to be a small sheep dog suitable for the rough terrain of the Scottish Shetland Islands. Some people call it miniature Collie and it was once known as Shetland Collie, but it is actually not a miniature version of the Collie and there are many notable differences between the two breeds. The Shetland Sheepdog information regarding its ancestry is somewhat vague, but we know that one of the main contributors to the breed is the Border Collie. The Shetland Sheepdog is believed to be the result of Border Collies breeding with several other herding breeds, including Scandinavian herding dogs and the Rough Collie, on the Shetland Islands over the past several centuries. The breed contains genes from both the Icelandic dog and the Greenland Yaki. When of the most time consuming aspects of Shetland Sheepdog care is to maintain their double coat, but brushing it once or twice a week is actually enough. This makes the Shetland Sheepdog to a fairly low maintenance dog. The topcoat consists of long, straight hairs that repels water, while the undercoat is short, dense and furry and protect the dog from harsh temperatures. If you want to make the Shetland Sheepdog care easier, you can spray-mist the coat with water while brushing. Always check the fluffy fur on the hind legs, the spot behind the ears and the spot below the front-leg elbow since this is where mats tend to form. Check ears, eyes and mouth during each grooming session and trim toenails and hair between the pads once in a while. During spring and fall, the Shetland Sheepdog needs more frequent brushing since this is when they 'blow' coat. The Shetland Sheepdog puppy is an adorable creature, but before you decide to get one for yourself you should make sure that this breed is the right one for you. The Shetland Sheepdog is an agile and intelligent dog that requires loads of physical and mental stimulation. Getting a Shetland Sheepdog puppy is therefore a good choice if you are interested in spending a lot of time training your dog, e.g. obedience training, agility, herding, flyball or general problem-solving activities. It is not an ideal choice if you prefer to take your dog for a short walk around the block a few times a day. As mentioned above, the Shetland Sheepdog loves training and needs both physical and mental stimulation to feel good. In addition to basic obedience, Shetland Sheepdog training can for instance involve agility, a sport where the handler directs its dog though an obstacle course in a race for time as well as accuracy. Your Shetland Sheepdog must be trained to run off-leash, and you are not allowed to use food, toys or similar incentives. In their size group, Shetland Sheepdogs are known to place themselves very high in agility competitions. According to the American Kennel Club standard, the aim of Shetland Sheepdog breeding should be to create responsive, affectionate and very loyal dogs. It is okay for a Shetland Sheepdog to be reserved towards strangers, but not to the point where it would be considered shy and nervous. During dog shows, it should never display signs of fear. The Shetland Sheepdog is a popular breed, and there are a lot of different Shetland Sheepdog breeders to choose among. Since the breed is plagued by several serious health problems, it is important to stick to Shetland Sheepdog breeders that take action to minimize the risk of unhealthy dogs. Shetland Sheepdogs should always be screened and thoroughly vet checked before they are used for breeding, even if the dogs seem to be perfectly healthy. 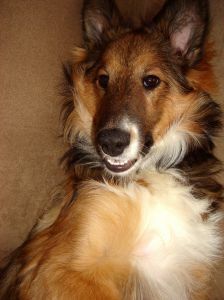 Just like the bigger Rough Collie, the Shetland Sheepdog is prone to inherited malformation and disease of the eyes, including Collie eye anomaly (CEA) and progressive retinal atrophy (PRA), and a reputable Shetland Sheepdog breeder will make sure that all puppies are examined by a qualified veterinary ophthalmologist before being sold. The breed is also inclined to develop epilepsy, skin allergies, dermatomyositis (often misdiagnosed as sarcoptic or demodectic mange) hypothyroidism, and Von Willebrand disease. Even tough hip dysplasia is uncommon in small breeds, it has been diagnosed in Shelties. The Shetland Sheepdog price varies a lot from breeder to breeder, and also between different parts of the world. It is therefore difficult to give any general recommendation regarding what a “reasonable” price would be. The most important thing is to find out what you actually get for your money. Has the Shetland Sheepdog puppy been vet-checked, vaccinated and de-wormed or will you have to pay for this yourself? Are all breeding documents in order? Does the Shetland Sheepdog breeder you have chosen have reputation of developing healthy and well socialized dogs? The expected life span for a Shetland Sheepdog is 12-15 years. Trying to save a few bucks by buying your Sheltie from a puppy mill or similar can be a costly decision since it will increase the risk of getting an unhealthy dog.